Published today in the UK and the US. For a little while longer, the ebook is still available at the special price of £1.99 (or $1.99), but why not consider the lovely hardback? ﻿More details (and a couple of extracts) over on the web site. 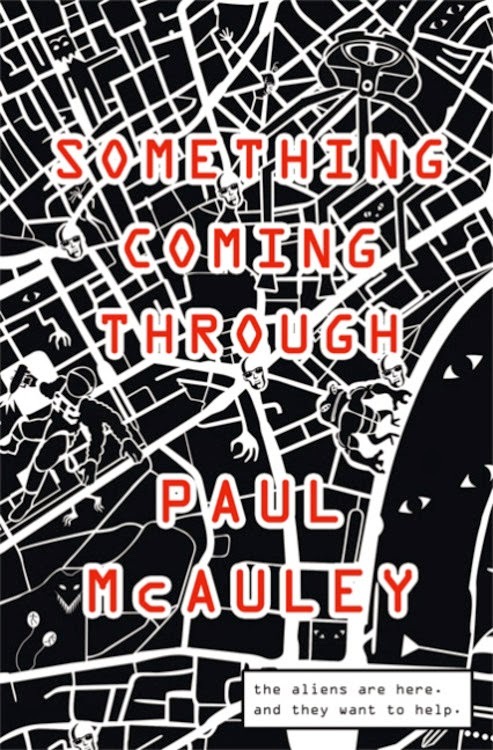 In the week that my new novel, Something Coming Through, is published, I am coming to the end of the second draft of the follow-up, Into Everywhere. 'Second draft', of course, being a very loose term for what is actually a patchwork of second- and third- and fourth-hand revisions of the structure of sentences, paragraphs, chapters. Writing the first draft of a piece of prose inside a word-processing document is superficially similar to writing in longhand or on a typewriter, in the sense that words accumulate from left to right on pristine whiteness (if that's your default) like footprints in snow, but even in first draft the fluidity of word-processing allows endless tinkering. If you're not careful, it can take forever to get past that first page, or that crucial first paragraph. I wrote my early short stories and my first published novel (and a couple of earlier novels I was in retrospect very glad to junk) on a typewriter. You xxxx'd or Tipp-Ex'd out words or even a sentence or two as you went along, but short of retyping the entire page you couldn't rearrange the text in any substantial way. You thought of a sentence, sometimes doodling with it on a scratch pad before you got it right, and then you typed it out. And then you thought of another, and typed out that. And so on to the end, when you took out your red pen and savaged the manuscript and then started over at the typewriter. But of course the process is open to constant revision in word processing. You write a sentence and look at it and realise that you have it back to front and put it in the right order then and there. You swap sentences around. You delete and restore them. You move paragraphs or entire scenes from one place to another. And then you move them again. The 'second draft' of Into Everywhere is full of changes like that, some following revisions red-penned on the print-out of the first draft, others made in mid-flow. But the biggest revisions of all are still the kind of changes I used to make back in the days of typewriter, Tipp-Ex and scratch pad: I've cut the first draft down from 160,000 words to about 145,000 by junking around 50,000 words and writing 35,000 new ones. Because now I know what I need and what's superfluous. All I have to do now is make sure all the words are in the right order.